"We have to avenge Duke. He's...he's in a coma." I’d heard it tested poorly, but I had no idea that one of the main things that they need to go back and change is that test audiences were upset that Duke, played by Channing Tatum, died in the beginning of the film. That’s right. THEY’RE UNDOING DUKE’S DEATH. AGAIN. The fact is that Paramount became extremely concerned about G.I. Joe 2‘s box office prospects worldwide after test scores were mediocre to bad. Reshoots were needed. Plus, the moguls realized what a complete miscalculation it was to kill off Channing Tatum in the sequel. And even more so at the start of the film. You will remember that Tatum wasn’t a star when the first G.I. Joe was released. But since then his back-to-back successes in The Vow and 21 Jump Street have made him into a draw. And it turned out that the only bright spot for audiences as a result of the G.I. Joe 2 testing was the aborted relationship between Tatum and Dwayne ‘The Rock’ Johnson. 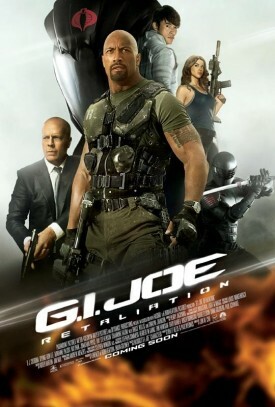 Plus look at the movie poster for Retaliation: you wouldn’t even know Tatum is in the sequel. Now the movie is being reworked – and reshoots don’t lose a valuable leading man like Tatum by killing him off. They should’ve just done the same thing here. That would’ve been awesome. Well, anyway, this film’s going to be even worse than the first one and anybody that thought otherwise needs to have their head examined. A big problem with the first film is that it was one of the goofiest films I’ve ever seen, and yet it still somehow managed to be completely and utterly joyless. If it had been done on purpose, I would consider it art.